Last night I listened to a really fun and informative podcast by The Scrap Gals on the topic of Memory Planners – using a planner to help stay organized and also save as a scrapbook-like keepsake with photos, decorative papers and all kinds of other fun things that we associate with scrapbooking. I’ve saved old planners or calendars on occasion because the records in them really bring back vivid memories. Memory planners are a really great idea but I don’t anticipate having the kind of time to exploit the idea to the fullest. One idea on the podcast that really had me intrigued was the idea of combining an art journal with a planner. This got me thinking. I have kept sketchbooks since 1985 and I’ve saved all of them. They have a lot of thumbnail sketches and notes about future projects in them, and occasionally other things that get in there because it’s the handiest blank paper around – supply lists, to-do lists, hours that I’ve worked for various clients to be transferred to electronic records later, web site notes, class notes, things like that. 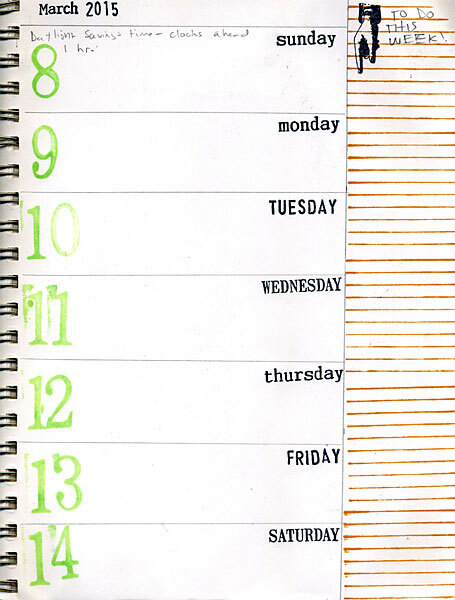 A sketchbook could incorporate aspects of a planner. 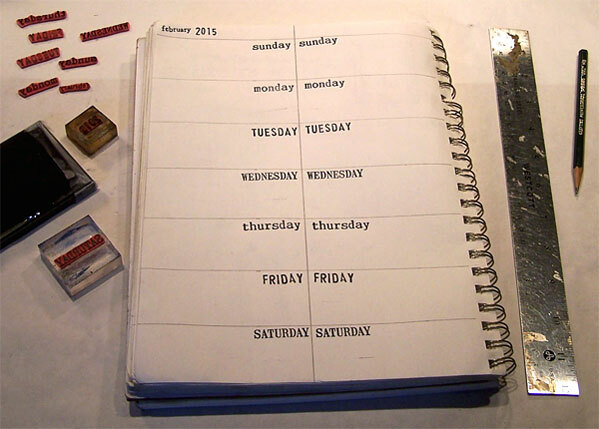 I have rubber stamps in my Carolyn’s Stamp Store collection with months, years, and days of the week – designed for memory crafts, but adaptable for making a planner too. I also have several sets of letter and number rubber stamps and stencils from other companies, some are even vintage. Along with my rubber stamps, I got out a pencil and ruler and started playing around with page layouts. This is the layout I’m going to stick with for awhile. The month, day and year stamps are from my own Carolyn’s Stamp Store. The large numbers are from ‘Lil Davis Designs and the pointing hand and ruled lines stamp are from 7gypsies. A page like this is quick to throw together. My stamping got a little sloppy there on the numbers but this is pretty much for my eyes only so it’s not a big deal. My plan is to add a new week as needed wherever the next blank page happens to fall in my sketchbook. I’ll write in things like work schedules and appointments and also make a brief note about what I did that day. I went through my rubber stamp collection and picked out ones I thought suitable for journaling and put them all together in a bin with the inks I used on this page so they’ll be handy when I need them. I’m looking forward to this new way of getting organized and recording my activities. When this sketchbook is full, I may switch to a 3-ring binder and put 8.5 x 11 inch sheets of drawing paper in it, with the flexibility of adding additional pages wherever I want of any kind of paper or cardstock if I want to expand the memory aspect of the planner/sketchbook combo.